2016 is shaping up to be an absolutely massive cycle based on what we saw last Tuesday, our first end-of-quarter (EOQ) deadline day. We processed $2.1M, making March 31st the biggest start to a cycle in our history. It was a 200% increase over the first EOQ deadline day of the 2014 cycle. We’re seeing more and more campaigns, organizations, and committees getting started fundraising early. And, ActBlue is now the default choice for large campaigns. Every major Senate campaign launched this year has launched with ActBlue and is using our platform. Here’s a look at the topline numbers for Q1 2015 and how they compare to the previous four Q1s. The best comparison is to 2013, because it’s the most recent off-year. The last election cycle started with a $16.4M first quarter and ended with $315M in total. Meanwhile, we just posted a $26.6M quarter. So, 2015-2016 is gonna be big. Compared to the most recent presidential cycle’s first quarter (Q1 2011), we handled 5.5x as many contributions and 3x as many dollars. Overall, there were 39.2% more campaigns and organizations fundraising during this cycle’s Q1 than the first quarter of the 2014 cycle. But, we’ve also handled 69.5% more contributions and 61.5% more volume. We’ve been talking about how great recurring donations are for a quite a while now. They’re increasingly becoming a critical piece of the fundraising strategy for the thousands of campaigns and organizations that are building pools of sustaining donors. Recurring volume has never been this big. In fact, 28.4% of the total dollar volume for this past quarter was recurring, which is the highest ever. 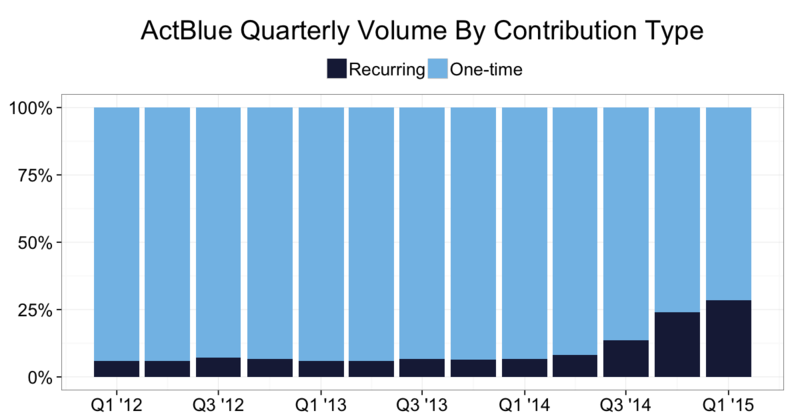 These quarters have similar dollar volumes from one-time contributions, but there was a massive change in the recurring volume. The $10.1M difference in total volume is primarily a result of the 7.7x increase in recurring dollars from Q1 2013 to Q1 2015. Recurring sign-ups from previous months are already paying dividends and will continue to throughout this cycle. Plenty of new campaigns are focused on building their pool of recurring donors early in the cycle. In addition to helping campaigns and organizations hit their goals, these recurring contributions ultimately give early supporters a sense of investment that will continue to increase as we get closer to Election Day. The number of ActBlue Express users grew to 1.27M, and these users are powering Democratic organizations and campaigns across the country. They have saved their payment information with us and can donate in a single click with Express Lane. This quarter we added 45,295 new Express users. Express users accounted for 55.4% of the total dollars raised and 58.4% of all contributions this past quarter, part of a steady growth trend we’ve been seeing for years. During Q1 2015, the Express sign-up conversion rate was 22.0%. That’s up from 18.5% during the last quarter of 2014. One of our big goals this cycle is to increase the number of Express sign-ups because, quite simply, they are our power users. Here’s a tip for campaigns and organizations: If you’re not already sending Express Lane links to everyone on your list, now’s a good time to start. Doing so will likely increase the number of Express users on your list, which will go a long way toward increasing overall conversion rates for your program. You can read more here. Donors love the convenience of not having to re-enter their credit card information each time they give. And that makes an especially big difference for mobile conversion rates. The percentage of contributions made on mobile devices was 24.7% for this past quarter, but that figure bumps up to 26.7% for Express users. 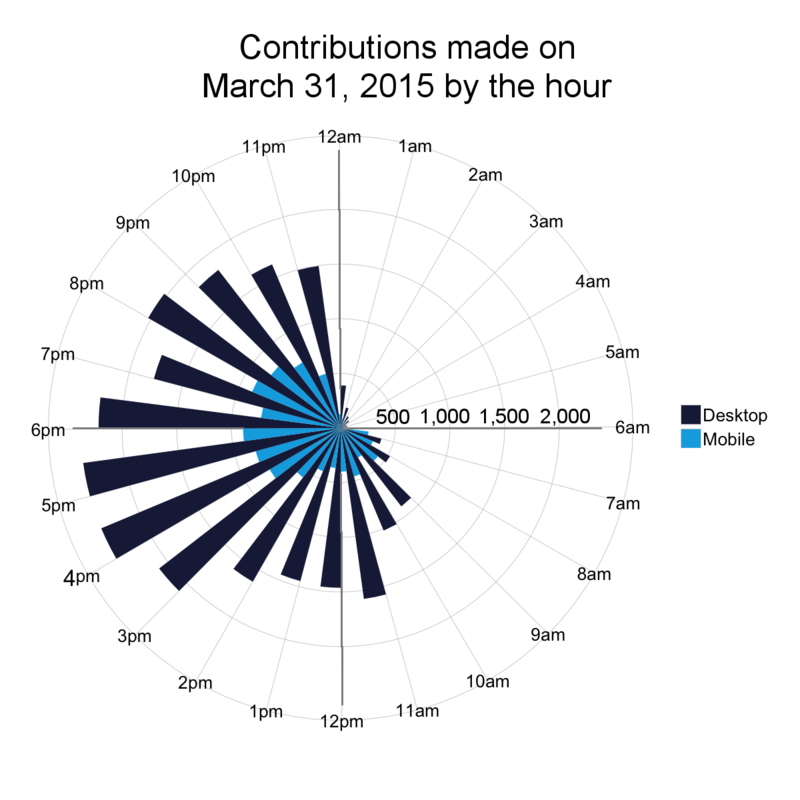 The chart below shows newly made contributions on March 31, 2015 broken down by the hour and device used. You can see that the share of mobile donations picked up outside of typical work hours. The 2016 election cycle is just beginning, so now is the time to hone in on your program’s effectiveness. Two quick reminders: it’s the start of a new month, which means now is a good time to check-in on your recurring retention rates for the month of March. And don’t forget that you can also monitor conversion rates by refcode on your form’s statistics pages.